Well.....the roof is on and with shingles set and awaiting the roofers. 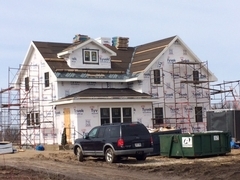 House is wrapped and windows are in. We have been meeting with the owners to go over details on the inside, adding several personal touches and repurposing of some of the old beams from the original house.